♥ I am thankful to God for seeing us through another year! How time flies! Today is 31 December 2009, the last day of year 2009. Tomorrow we will enter into year 2010, a new year in our walk with the Lord. Here's wishing you a very happy and blessed New Year! ♥ I thank God for all His goodness and mercies to me in year 2009. The Lord has brought me saftely through all the ups and downs through the various changing scenes in life. His mercies has been abundant and His grace sufficient for me. I am thankful to God for His many blessings. ♥ I thank God that we are More Than Conquerors through Jesus Christ Who loved us! No matter what we go through in this life, we have a God Who loves us and He is with us always. He has promised He will never leave us nor forsake us and nothing can separate us from His love (Romans 8). We are more than conquerors through Him Who loved us! I have listed my blogging friends whom I have gotten to know since I started blogging 2 years ago. All of you are More Than Conquerors as you have been very courageous and resourceful no matter what difficulties or trials you are going through! Please accept this Award as it is Yours! I am still adding new blogging friends to this list. 2) Put your cursor on the picture of the "More Than Conquerors Award"
4) Choose "Save image as"
5) A small window will open up. 6) For Title put "More Than Conquerors Award". 7) For Caption, most people thank the person who gives them the award. So if you want, you can put "Thanks Nancie!" 9) Image - at from your computer, click at "Browse"
Thank you for stopping by. Take care and have a blessed day and Happy New Year! Hello dear friend. the award is lovely and I know just the lady who could use it. Her name is also Michelle and she has been battling breast cancer this year. god bless you hon! I'm thankful to be getting to know you. Blogging seems to make the world smaller and more reachable, no matter where you live. And I'm so glad that we share our faith in Jesus as that makes us sisters in Christ. Thank you for such a wonderful award. 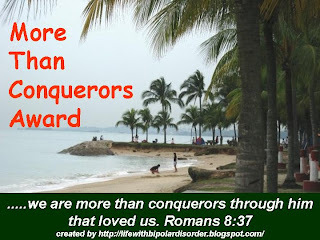 Yes, we are more than conquerors with Jesus. You've taken such time and care to list each blog; wow! Thank you for how you explained the "how to" also. I enjoy reading how the Lord has worked in the lives of others. Wonderful blessings! Sweet blessings Nancie, I am thankful for YOU! You are such a beautiful expression of God's love & grace, indeed MORE THAN A CONQUEROR! I love your creative side! I love how you turned your profile icon photo into a blog award with your verse! much and are more than a conqueror! Your wellness and balance of life are much needed priorities. Yet you are able in Christ Jesus to do all things and I trust as you do in God to help us keep overcoming! Look at this long list of blogger friends that you have encountered and blessed. I pray that each one continues to uplift you in prayer for your well being and bless you in all that they share as we journey forward together as Christian sisters! You are more than a friend, you are our sister! You are so thorough and helpful! A real source of inspiration and a beautiful, grateful heart that shines Jesus! In 2010, may you bloom again, as a righteous child of the King! May His grace and power fill you with MORE of Him! May Jesus lift you up and carry you through each day. May 2010 bring you more strength, more joy, more triumphs, more comfort, more peace, more of Jesus!!! He is the Light and the Rock! Look to Him! Thank you for this special AWARD and reminder of YOU! (I may not post it though because I'm trying to be a Award & Tag Free post...but I will add it to my sidebar and my AWARD page)! Thanks so much Nancie! Thank you sooo much for the award!! Your a dear and kind sweet friend to me:) Thank you always for encouragement and prayers!! Wow you have a lot of blooggy friends. Nice award, great verse. Off to browse your blog. What a great award you have created for so many. You are a wonderful person. I am so glad to have shared so many days of gratitude with you. As every day is so special and so much in this life to be thankful for. Many blessings to you and a big hug. Have a wonderful new year. And thanks for including me on your list. Thank you so much for the award.That was so kind. You are a Blessing.May God Bless you and your family as we enter 2010.Happy New Year. I love your thankful list. You're such a blessing to all of us. Thanks so much for the award, my sweet sister in Christ! You are such a sweetheart to think of so many people in such a touching way! Your thankful list is wonderful. It is so great to know that we can be there for each other in this great big world. God is so good! Have a wonderful weekend and Happy New Year! What a lovely award! Thanks so much...will post them later today. Nancy, happy new year to you and to your family. May 2010 be kind to you and bring you more joy, laughter, love, peace, success and good health! (((Hugz)))... Thank my beautiful friend for this special award, I am so blessed to know you and to have you as my sistah!!!. This award is a confirmation of what the Lord spoke to my heart today. I will post it sometime today,.titled: Victory" and you see what i am taking about.. so check back on my blog later. This is my first visit. Wow! What a list of online friends, and what great thoughts. My goal for 2010 is to keep spiritual truths in mind, especially the facts of universal love, cosmic unity, and the rightness of creation. I am not Christian, per se, but I am so pleased to hear your thanks to God. We all need to recognize the love that surrounds us, and it helps me to remember those truths when I read your gratitude. Blessings for the New Year. My dear, dear Nancie. I may not be a frequent visitor but you are in my thoughts everyday. You are so gentle and caring and thoughtful and loving that when I am on the verge of complaining about some things I think of you. I hope and pray that 2010 will be a very good year for all most especially to you, Nancie. Thank you for the beautiful award. God bless you always. I feel deeply touched that you would think of me and include me along with these other amazing bloggers. I know many of them... And like you.... they love Jesus. I see Jesus each and every time I stop here to share TT with you. Your struggles become triumphs in the light of your faith in Christ. I am inspired and count you as a rich blessing in my life. Just came over for a visit and love your lists and lists of thankfullness. I got to reading several chapters of the podcasts by the Scottish minister and found them really good to read and was reminded of my times of slipping into negative thought patterns. Just what I needed today. I have bookmarked the webpage and plan to revisit and download some of the podcasts. Thank you and every blessing to you and prayers for victory and recovery in whatever you are going through right now. Hi Nancie! Today I have given you an award: the Princess Award! As a child (daughter) of the King, you are truly a Princess, and your blog exemplifies the qualities of a child of the King very well! I am grateful to have met you through blogging! Please come to Faith's Firm Foundation anytime to receive your award! Thanks for blessing all of us! Thank you for stopping by! It is so good to hear from all of you. May you continue to be More Than Conquerors daily!